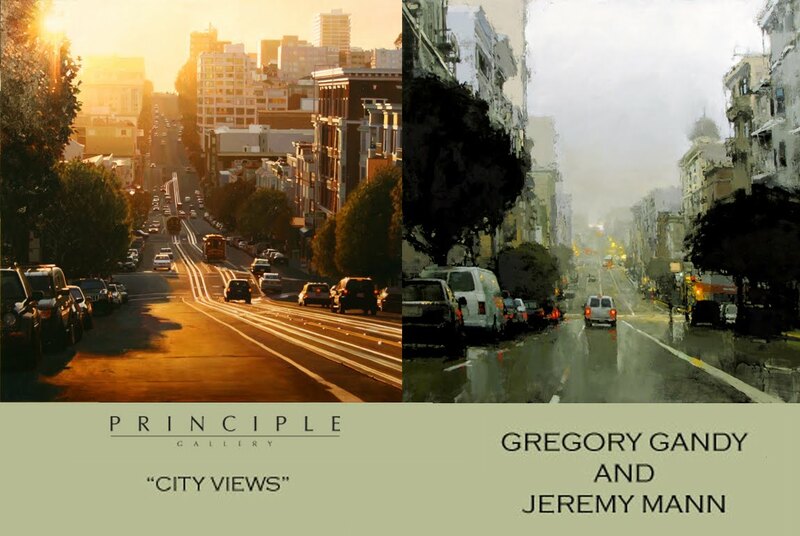 Principle Gallery in Virginia, recently showed a painting exhibit named 'City Views' featuring the work of San Francisco-based artists, Jeremy Mann and Greg Gandy. 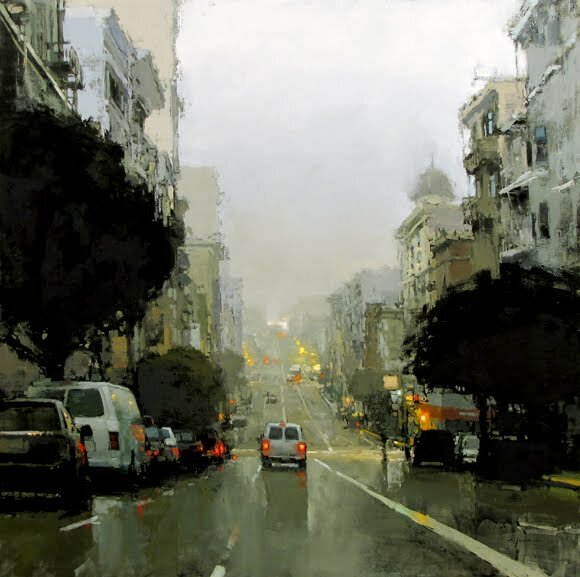 I have long been a fan of Greg Gandy's and am now a new fan of Jeremy Mann's as well. 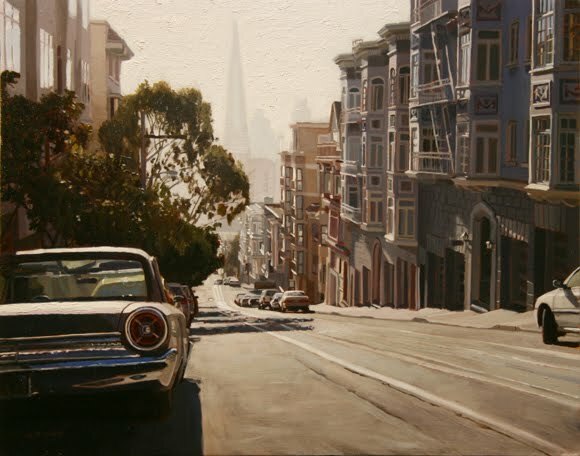 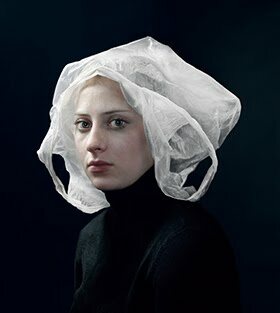 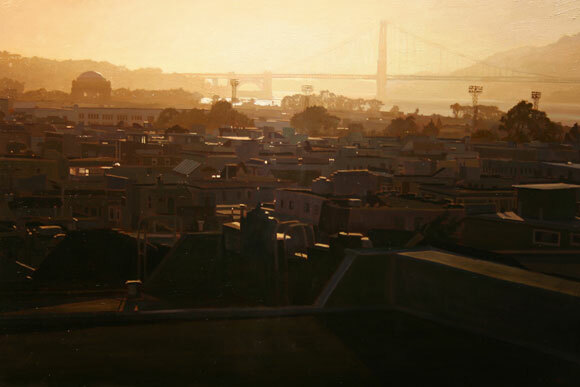 Having grown up in the SF Bay Area, I feel these contemporary artists captured the essence of the unique urban experience and ambiance that is San Francisco. 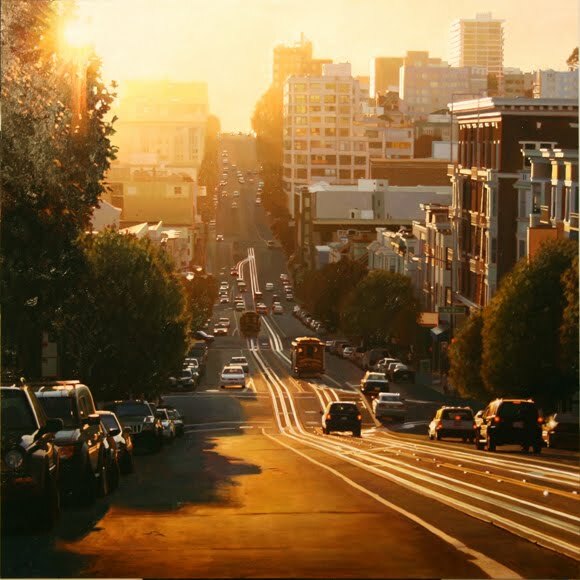 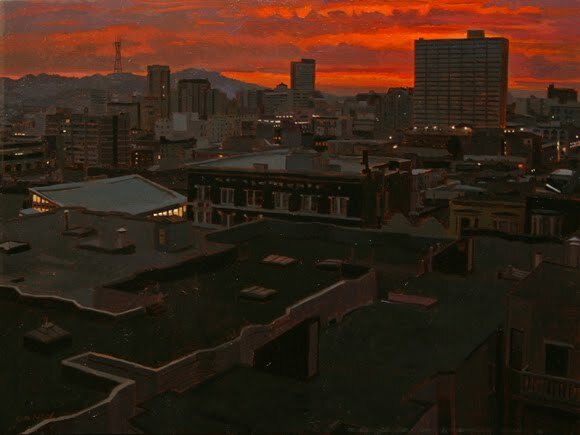 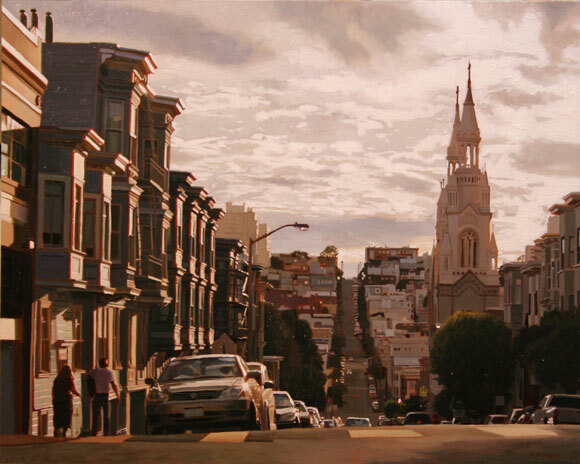 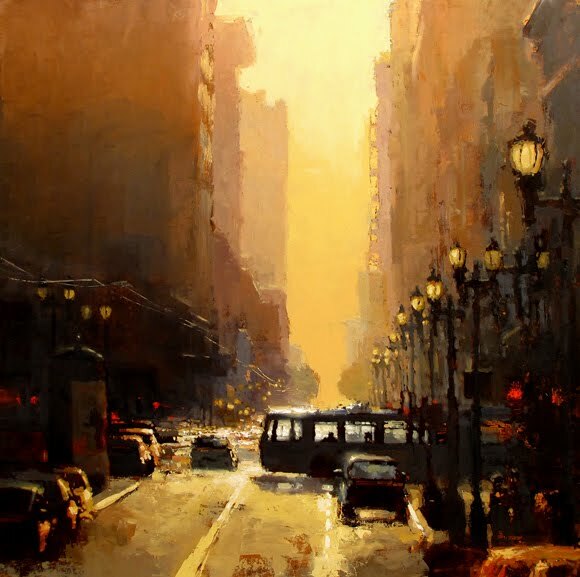 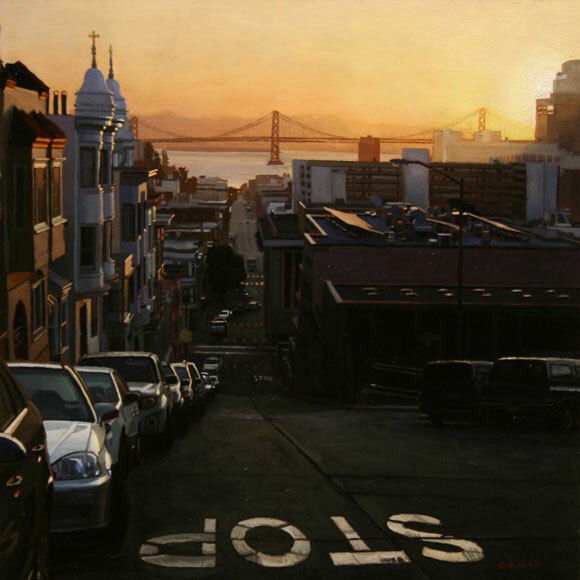 In Greg Gandy's photo realistic paintings, the golden light of sunrise and sunset (the "magic" hour) is a major element, as it bounces off the sloped hills and city buildings silhouetting, or back-lighting, city buildings, cars and people. 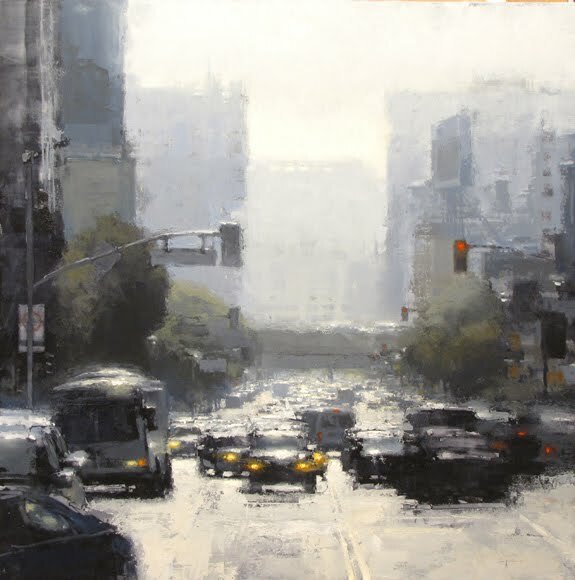 Bridges and freeways peek out through sunny glares and midday fog. 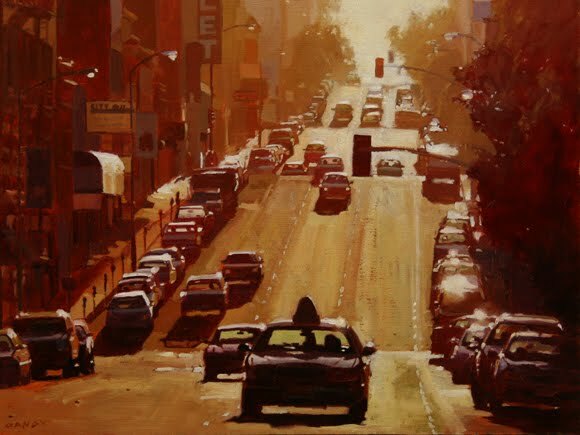 Even the omnipresent city traffic on the one-way streets is executed in such a manner that it simultaneously summons both attraction and familiarity. 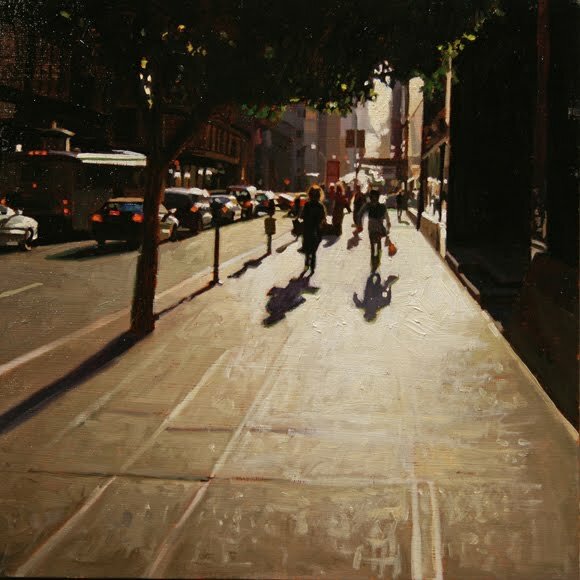 Shadows are long and inviting as opposed to being ominous. 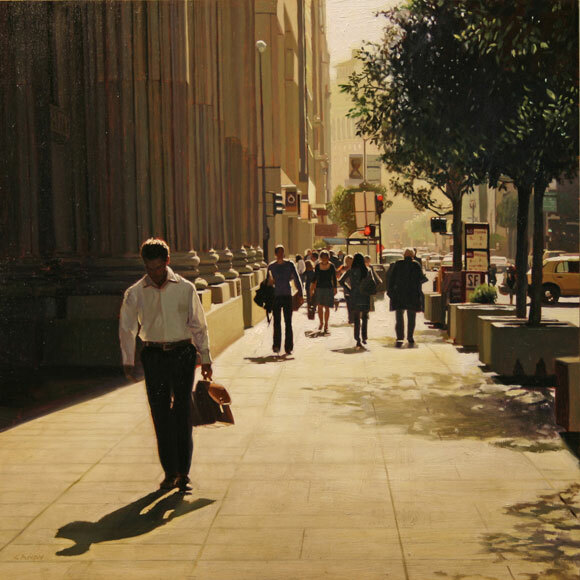 The city is crowded and active but feels serene and unrushed. 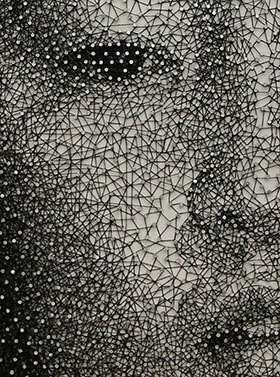 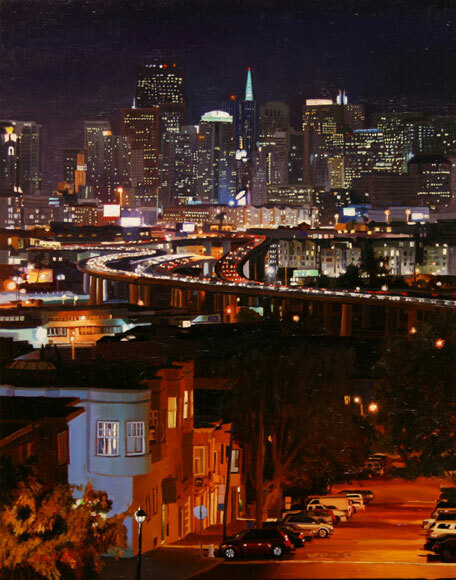 His works fill the viewer with a calm glimpse of busy urban life and can be gazed upon for hours on end. 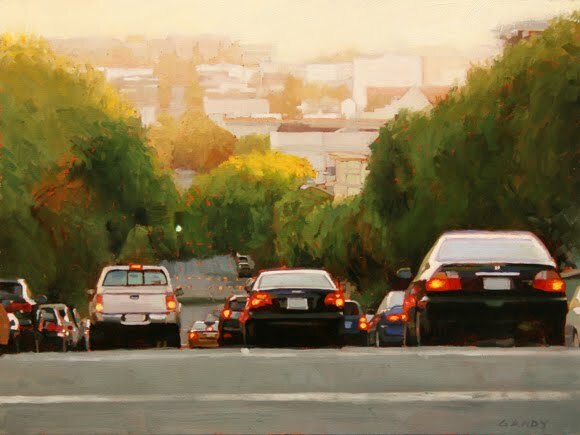 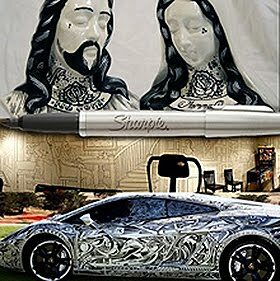 See more Greg Gandy paintings and inquire about the sizes, prices and availability here. 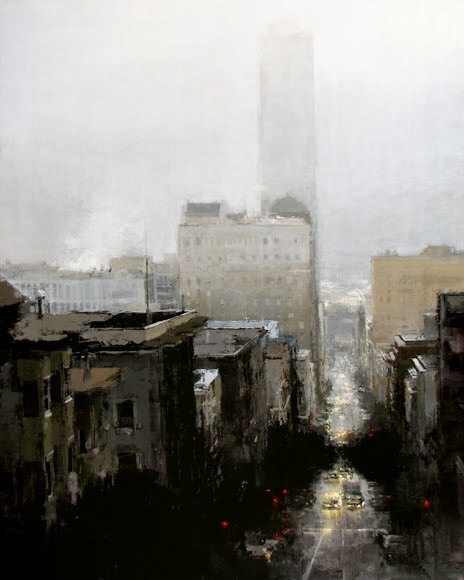 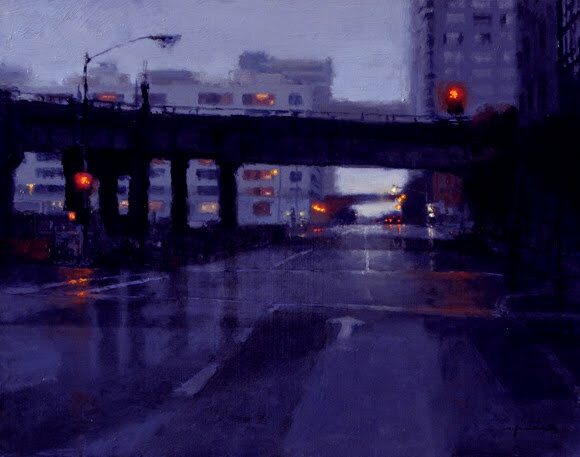 In Jeremy Mann's work, which is more loosely executed than Gandy's with visible brush strokes and a more frenetic painting style, the seductive allure of the city's rolling fog and rainy wet streets is undeniable. 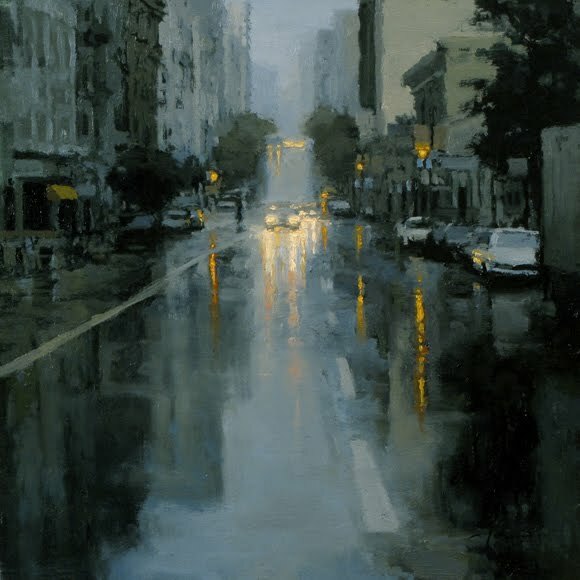 His nighttime scenes, with blurring headlights and streetlights reflecting on the wet pavement, perfectly combine a loneliness with longing. 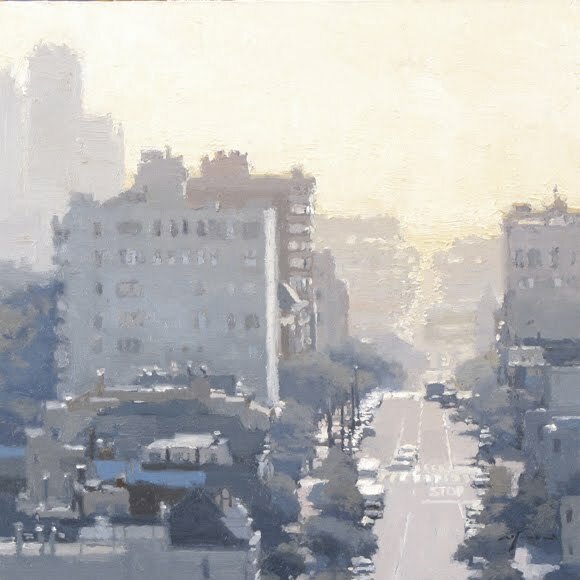 In several of his other works, he captures the 'midday haze'; a mix of activity, atmosphere and the look and feel of heat rising from pavement or mist as it hangs above the asphalt. 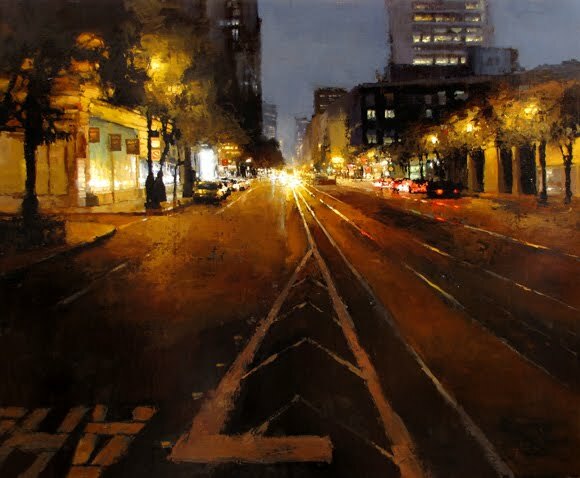 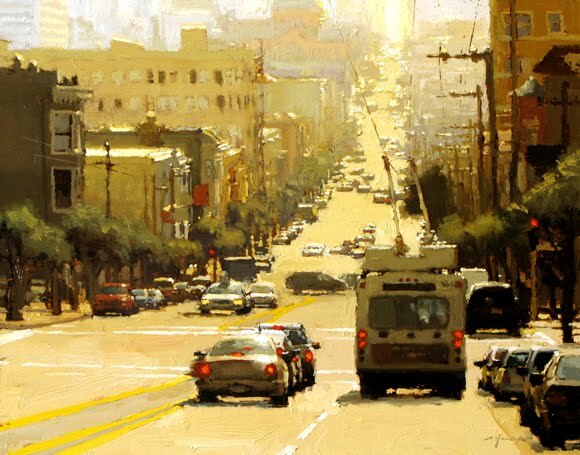 Bathed in blues, greys and yellows, he immortalizes both the emotion and beauty of the 'City by The Bay'. 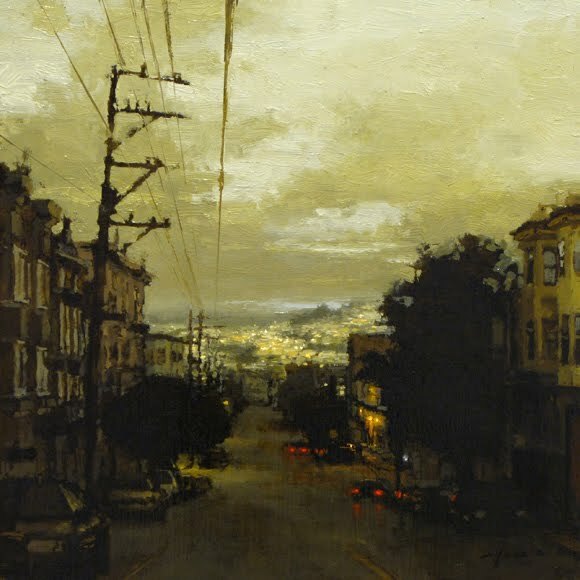 See more of Jeremy Mann's work and inquire about the sizes, prices and availability here. 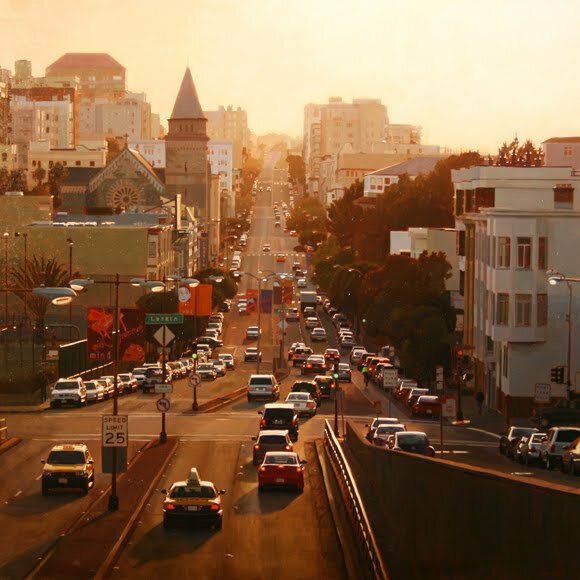 If you have a fondness for San Francisco, or just enjoy urban paintings, these two young artists have managed to capture the essence of a populated city with a calming gestalt. 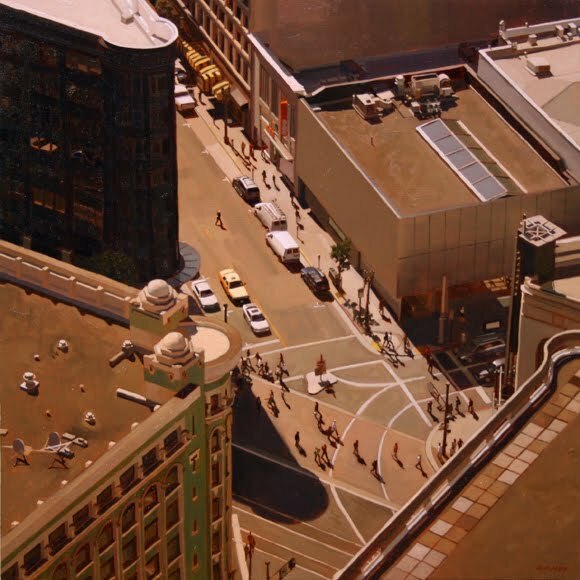 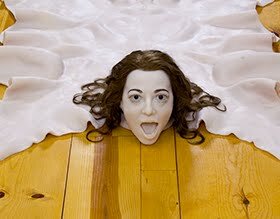 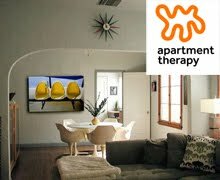 They both work in oils and sizes of the works are as small as 12" x 12" and as large as 51" x 48" . 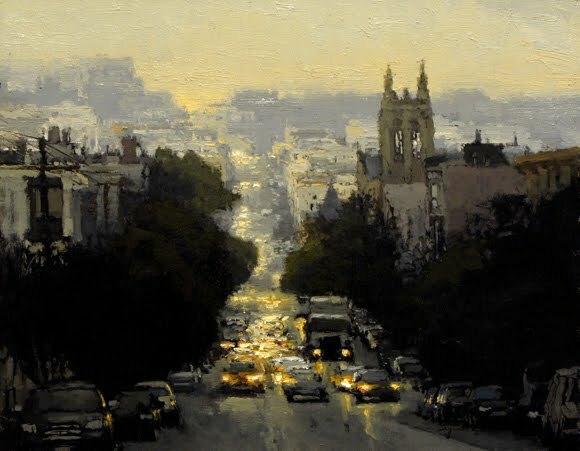 These two artists were also featured last year in a show of Cityscapes at Studio Gallery in San Francisco which still has some smaller pieces of both their work available.